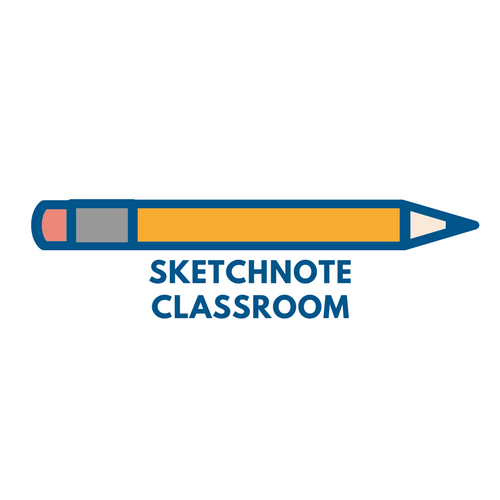 Sketchnotes is a term invented by Mike Rohde. He found his traditional note taking methods didn’t work at conferences. He tried to capture everything in written words but it was stressful, he remembered little afterwards and he never revisited his notes. So he tried sketchnoting, where he set some creative constraints to help him focus on capturing the big picture in the moment. and not trying to capture everything, but focusing on the key points. As such, Mike called sketchnotes “Notes Plus” they are traditional written notes PLUS other elements like different forms of text and headlines, speech marks and other containers, arrows and dividers and of course, icons and drawings. They also make use of different systems to organise content in effective ways and not just moving from top to bottom of the page. In some cases, people make extremely beautiful pictures, but Mike insists that it is about Ideas, not art and that making something beautiful is the cherry on top. The real benefit is the process and learning method. Which brings us nicely onto WHY you should use sketchnotes. Sketchnotes engage the brain thanks to their use of both the verbal and visual centers. This, along with other aspects of sketchnotes character provide several benefits. The creative limits help you to focus on what is most important for you. You can’t fit everything in, so you need to cut somethings out. This requires you to process the information and evaluate, is this really important? Is this a key element? Sketchnoting requires concentration to focus on what the source material (a speaker or a text) is telling you and avoiding distractions around you. This practices of sketchnoting building your concentration by requiring this regular focus. This can lead to a state of “flow” where you are stretched by the challenge of listening, analyzing and noting all at the same time. A highly rewarding state to be in. Sketchnotes are better for remembering information. They require you to draw connections between data and show how they are connected in your notes. They also require personalization beyond simple words as you make choices over the correct font, graphic or item to include or not. And studies have shown that drawing information helps you to recall it better than simply writing a word down. Sketchnotes are also creative which helps unleash the talents of people who might otherwise feel put off by attending a session of having to take notes. This also makes them a fun thing to do, which makes the whole process of notetaking more motivating. These aspects can make sketchnoting a highly relaxing process where you don’t have to worry about writing every word someone says, but focus on the big picture and let your creativity run wild. You can also experiment with different things to sketchnote whenever you like. Such as sketchnoting your travels, or your lunch, or even a song. The net effect of this is that sketchnoting makes note taking more effective for remembering, more creative and a more enjoyable process. You’re also more likely to want to look at your notes again and share them. Wins all round.